The Staying Well Team held another successful event at Halifax Academy Primary School. 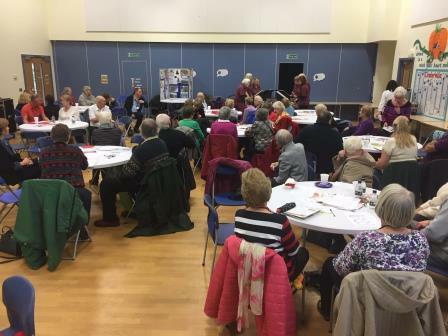 The ‘Bring Your Neighbour‘ event was attended by over 80 local residents, there were demonstrations by Tai Chi Tigers, Line Dancing and the ‘ Ryburn Ringers’ and Fuel Poverty also attended to talk about the benefits of affordable warmth. Amongst the other agencies who attended were Victim Support, Better Living Team, Macmillan and Citizens Advice, who were also on hand to offer advice and information regarding their services. The highlight of the day finished with the very popular singer Julianna, who managed to entice the attendees to show off their dancing skills! The Staying Well project works one to one, with people who are isolated or lonely to link them to social activities in their area. Staying Well is about helping you to stay healthy and improve wellbeing. Referrals are for anyone 18+ and can include a chat with a Staying Well worker, a home visit and information and support to attend activities in your area. 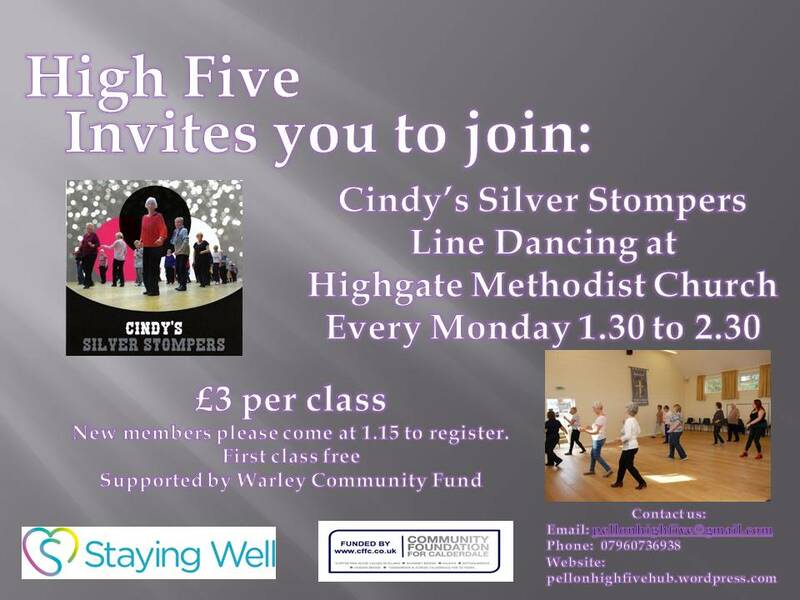 Highgate Methodist Church, Stretchgate Lane, Pellon HX2 0EU every Monday, 1:30 -2:30. Usually it is £3 per class but the first class is free. We would ask new members to come at 1:15pm to register. More information can be found by calling 07960 736938, email pellonhighfive@gmail.com or visit the website at www.pellonhighfivehub.wordpress. Pellon High Five has published the Winter 2019 newsletter, which can be downloaded here. Thanks to Jenny Garner for preparing the Christmas Quiz. This year’s Christmas party was voted a resounding success and the food was delicious. 2019 Membership renewal is due now. Happily once again, no membership fee but please make sure you complete the form (available from your tutor) with your up-to-date details. Pass them to the committee and they will be passed onto Angela, the Membership Secretary. Please put on which class/es you attend otherwise there is difficulty uniting you with your membership cards. In March High Five will be 8 years old! The AGM has been arranged for Friday 29 March, 2:00pm at Highgate. It’s later this year so that the Treasurer can present a more accurate full year’s accounts for the financial year-end in February. A plea here once again for new Committee members. High Five can only keep going if there is an active Committee. If you can’t join, maybe you know someone else who would? Below is shown the timetable of activities as at October 2018. 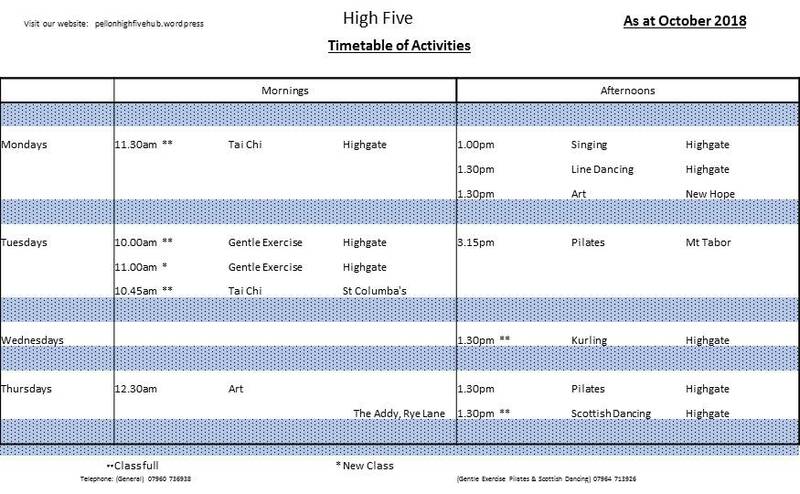 More information can be found by calling 07960 736938 or for pilates, gentle exercise and Scottish dancing from the tutor Sue Watson on 07964 713927 or email pellonhighfive@gmail.com or visit the website at www.pellonhighfivehub.wordpress. North and East Halifax Friday Flyer 25 January 2019 – OUT NOW! 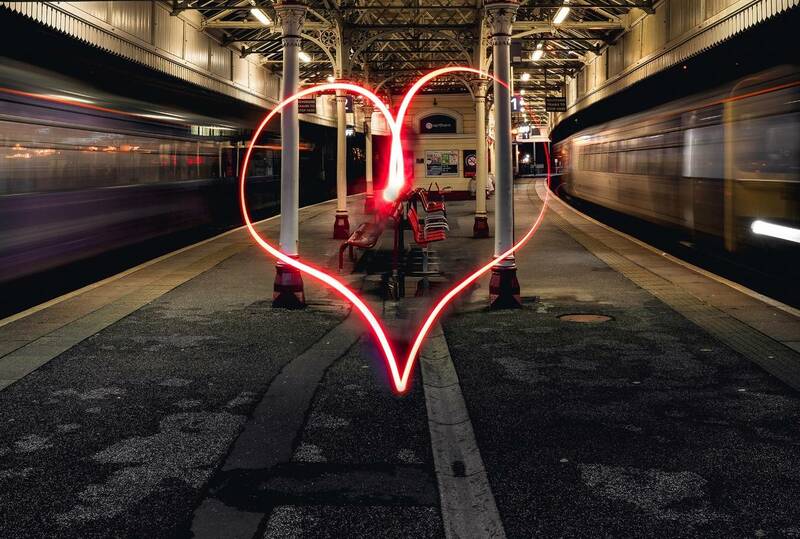 The website Calderdale Mumbler set up by Charlotte Gonzalez for the local parenting community to compile the wonderful things happening to connect families in Calderdale. They have highlighted the new group Healthy Mums Calderdale and have described the work of the new group as follows. It’s one of the happiest times of your life, but becoming a mum can also be the loneliest, scariest and most isolating. While we all like to think we are a shoulder to cry on for our family and friends, the reality is that many women are afraid to speak up, don’t want to admit they are struggling, and don’t know how to get help. Now Calderdale mum-of-two Erran Taylor – who had to wait two years for postnatal mental health care herself – wants to help by launching a healthy mums peer support group. Healthy Mums Calderdale will hold weekly meetings – the first is on Wednesday 8 February 2019, 7:00pm at The Basement Project, Basement House, 10 Carlton Street, Halifax HX1 2AL with monthly wellness workshops. The group is for women at any stage of motherhood, who might be suffering from anxiety, postnatal depression, need extra support or just want to connect. “The group was born out of my own personal need for a support network,” shares Erran, 30. “When pregnant with my firstborn, I was the first out of my friendship group to have children and, as my pregnancy progressed, I felt more and more isolated”. “When I had my son, I had issues from the start; he seemed to never sleep, breastfeeding wasn’t successful and I felt like I was some sort of failure for not getting what seemed like the basics right”. Erran started counselling and as she recovered, realised many other women had similar experiences. “People don’t openly share their struggles”, she says, “and pregnant women aren’t fully prepared for what might lie ahead”. “We’re not told about post natal depression, the possibility of not being able to breastfeed, the lack of sleep, real post pregnancy body images. All you hear about are either the fluffy and lovely bits of having a baby or what you and baby ‘should be doing’. Erran made it her mission to reduce stigma and normalise mental health issues, connect isolated mums and try to find something to bridge the gap between services and ridiculous waiting times. She trained as a peer group counsellor, and undertook training with mental health charity Mind. When Andy’s Man Club came about, she realised a similar group could be successful for mums. There will be weekly meetings, with one wellness workshop each month to equip members with tools to help themselves stay mentally well, through exercise, meditation and nutrition. Erran will invite speakers from external services such as yoga, massage, meditation, Sure Start, the midwifery debriefing team, health visitors and counselling service to let mums know which services are available and how they can access them. She is also exploring mother and children networking sessions so those without childcare won’t miss out. “We need to bring people from behind those closed doors and show them they’re not alone” she adds. Healthy Mums Calderdale is open to mums with children of any age. You might be pregnant, have a baby, school-age children or older teenagers and grown up children. Whatever your circumstance, you can come along and be supported by like-minded peers.